The Grand Princess offers an amazing opportunity to explore the coast of California, Alaska, Hawaii and Mexico. Step on board one of the biggest Princess ships and be surrounded by a friendly, comfortable atmosphere. The Grand Princess is famous for the dazzling entertainment and the tantalizing dining options. The chefs will prepare fresh dishes every day, so the pickiest of eaters will be satisfied. Specialty restaurants, buffets, cute cafes and the ultimate private balcony dining - you name it, the Grand Princess has it all. 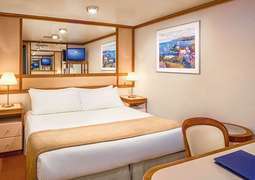 The accommodation on board is elegantly designed to make you feel right at home, all the cabins are fitted with state-of-the-art technology. Choose between the value-for-money Inside Cabins, Outside Cabins, Balcony Cabins and the luxurious Suites. Whichever one you go with, you will enjoy your cruise holiday to the full. 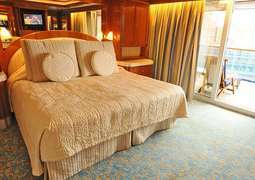 All cabins on board the Grand Princess are elegantly designed and promise a comfortable stay. Choose between Inside, Outside, Balcony or Suites with sizes ranging from 15m² to 69m². 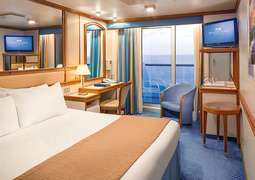 76% of all cabins on board have private balconies providing a wonderful view. Almost all public areas and many cabins are wheelchair accessible. The Grand Princess has numerous restaurants, bars, and lounges to help keep you satiated. In addition to three main restaurants, there are two specialty: the 'Crown Grill' is known for its steaks and seafood, 'Trattoria Sabatini's' serves wonderful Italian dishes and the 'Crab Shack' is for fresh seafood lovers. Other tasty locations for snacks and smaller meals include a hot dog and hamburger grill, a pizzeria, an ice cream bar, and an international bistro that serves specialties from all over the world. 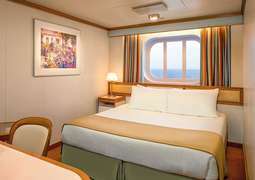 There is also a buffet and bistro, and a 24-hour cabin service. Grand evenings are promised in the countless bars and lounges for all gastronomes and music lovers. A diverse entertainment programme helps turn a journey on board the Grand Princess into an unforgettable experience. One highlight in particular is the 'Movies Under the Stars' open-air cinema, where you can catch all the latest Hollywood films while lounging on a comfortable deck chair under the night sky. The design of the spacious Atrium was based on an Italian piazza, giving it a wonderfully elegant ambiance. Fun and excitement for the younger guests on board can be found in the Children’s and Teens’ Centre, which spans two floors and has a great kids’ club and professional child supervision. A video game zone is also provided for virtual and real fun. Other great locations include a digital photography studio, a library, and an art gallery, which is a must visit for all art enthusiasts. Interesting lectures and presentations about your travel destinations, harbours, and attractions are also offered. A marriage at sea is naturally a one-of-a-kind experience and can be officiated by the ship’s captain in the wedding chapel. Colourful evening entertainment is provided in three show lounges with cabaret, shows, karaoke, and much more. Countless other bars and lounges also offer a friendly atmosphere in which to spend your evening. The Grand Princess is home to one of the largest swimming casinos on the high seas, offering courses for beginners as well as tournaments for advanced players. Another big highlight is the Skywalkers Nightclub and Observation Lounge, where you can dance the night away and enjoy a breathtaking view 150 meters above the sea. Sports enthusiasts will also get their fill of fun on board the Grand Princess, with great facilities such as a golf course, golf simulator, game courts, and an athletic track. Enjoy the view while working out in the fitness room, then cool off in one of the four pools, one of which is equipped with a cross current system. Relaxation can be found in abundance in the Lotus Spa. Casual clothing is welcome on board the Grand Princess. Smart-casual clothing is recommended for evening events, and fancier, more elegant clothing is advised for special occasions.